Austwick lays about seven miles North West of Settle, just off the A65 (about ten miles South East of Ingleton) Austwick appears in the Domesday book, mentioned as Oustewic, but appears in records predating the Norman account of England as Austwick held by the Saxon Lord, Torfin, who also held lands encompassing Warton near Carnforth and Claughton, home of the modern day brick works. 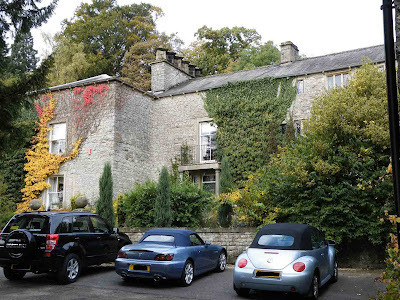 The lands around Austwick came into the possession of the Lancaster family, who held castles at Kendal and at Mourholme (near Borwick) The Grade II listed hall at Austwick is situated at the head of the village, and is reputed to have begun life as a pele tower, built sometime in the 16th century. Check the Images of England web site for some more information. The Hall is built on an L plan, with the hall to the North East of the site, and the alleged tower to the South West (the left of the above photo) The Austwick Hall web site tells us that the tower was originally built in 1180....but the present day building definitely only dates from the 16th century...at the earliest. There may well have been a hall or manor house on this site...but what we see today is not it. We are also told that the only remains of the pele tower are the six foot thick walls separating the entrance hall and the drawing room...a situation present in many other pele towers and tower houses throughout the county. It is a beautiful house, but as far as its history as a defensive tower is concerned, there is little evidence. This is the hall's official web site.